Let me tell you a story about Dr. Joel Fuhrman. Dr. Fuhrman was once a world-class figure skater who was forced from competition after suffering a serious heel injury, which led to crutches and long-term hospitalization. As it turns out, Dr. Fuhrman’s injury was a blessing in disguise. Proper nutrition and alternative medicine helped with his recovery, and it helped him continue competitive skating. His deep passion for nutritional information led him to the University of Pennsylvania School of Medicine, where he graduated in 1988. Now at the age of 62, Dr. Fuhrman lives a busy life helping people understand proper nutrition and disease prevention. 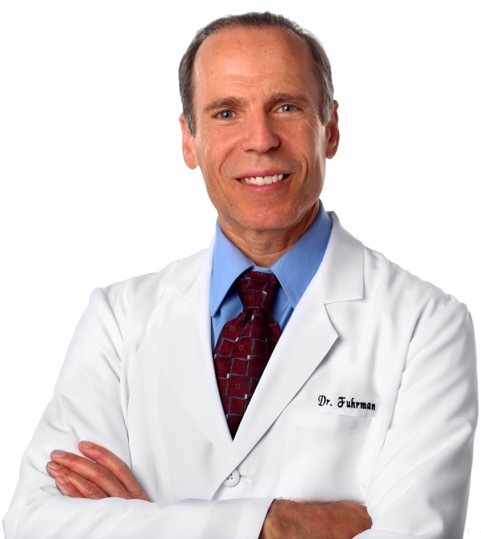 Dr. Fuhrman has written 10 books, including five New York Times best-selling releases. Book number 10 called The End of Heart Disease is being released later in 2016. He has been featured on popular radio and television shows, and has spread his message on The Dr. Oz Show, Live with Kelly and Michael, Good Morning America, and the Today Show. He even has three PBS TV shows: 3 Steps to Incredible Health!, Dr. Fuhrman’s Immunity Solution!, and Dr. Fuhrman’s End Dieting FOREVER! Dr. Fuhrman has created many nutritional concepts that have helped millions of people. This includes the Nutritarian diet or food pyramid, which is based on the principle of high nutrient eating and the health equation for longevity: Health = Nutrients/Calories (H = N/C). I recently had the pleasure to interview Dr. Joel Fuhrman. The following is an excerpt from our conversation, where he answers my questions about nutrition, disease, and health in society today. What led you to become passionate about nutrition and health? What motivates you to spread your knowledge? I think it was just all the reading about natural hygiene I was exposed to from my father. I came to understand that food has the largest impact on controlling our health and that the typical diseases that befall most Americans are the result of unhealthy eating. What motivates me is seeing the magic in action. That is the miraculous healing power of the properly fed human body. I have seen thousands of my patients and followers make complete recoveries from what are considered incurable diseases, such as psoriasis, lupus, asthma, fibromyalgia, and of course diabetes, high blood pressure, and heart disease. What is the Nutritarian Diet? What foods do humans benefit the most from? I use the word “Nutritarian” to describe a high-nutrient eating style that emphasizes vegetables, fruits, beans, and nuts and seeds. To get healthy, you must get the vast majority of your calories from these unrefined plant foods. Comprehensive nutrient adequacy: using supplements when necessary to avoid deficiencies and insufficiencies. Certain nutrients may be lacking, even in a healthful diet, for example, vitamin D, vitamin B12, and the omega-3 fatty acids DHA (docosahexaenoic acid) and EPA (eicosapentaenoic acid). And, certain people have higher requirements for some of these nutrients. I tend to keep my meals very simple. Most days I eat steel cut oats with nuts and seeds and berries, in the morning. For lunch I have a big salad with beans, onions, and a nut-based salad dressing, usually with a bowl of veggie-bean soup, and a piece of fruit. I have a light dinner with something like cooked greens, mushrooms, pistachio nuts, fresh tomatoes, and maybe a bit of my healthy deserts, such as vanilla nice cream (vegan version of ice cream) on a piece of a my healthy bean brownie recipe. I don’t snack, except for an occasional glass of fresh squeezed vegetable juice. What happens when you eat the Standard American diet? What does eating processed food do to the body? How serious is micronutrient deficiency in the U.S.? The Standard American Diet (SAD) is made up mostly of disease-causing foods, with 30% of calories from animal products and almost 55 % from processed foods. The foods eaten as part of the SAD, like animal products, dairy, oil, sugar, salt, white flour and other processed foods, are very low in micronutrients, especially those antioxidants and phytochemicals that protect against cancer, thus not supportive of longevity and long-term health. Micronutrients fuel proper functioning of the immune system and enable the detoxification and cellular repair mechanisms that protect us from chronic diseases. SAD foods are harmful to our health because high glycemic foods elevate insulin to the danger zone and the high intake of animal products in America elevate IGF-1 (insulin-like growth factor 1) into the cancer-causing danger zone as well. This style of eating leads to obesity, cancer, diabetes, heart disease, autoimmune conditions, dementia, etc. The lack of colorful produce makes all Americans dangerously deficient in the powerful compounds found in unrefined plant foods that protect us against disease and premature aging. On top of all of this, SAD eaters are food addicts. A healthy weight is almost impossible to maintain without attention to excellent nutrition, because a low nutrient diet fuels toxic wastes and uncomfortable withdrawal unless the digestive track is kept constantly busy. People have to eat all the time and remain overweight in order to feel normal. Only with attention to nutritional quality can excessive eating be comfortably controlled. What is the Aggregate Nutrient Density Index (ANDI)? Describe what ‘nutrient density’ means. Nutrient density compares the amount of nutrients in a food to the calories. A nutrient dense food would have a high number of nutrients compared to calories. To illustrate which foods have the highest nutrient-per-calorie density, I created the aggregate nutrient density index, or ANDI. This index is currently being used at Whole Foods Market grocery stores to help customers make healthier food purchases. The ANDI ranks the nutrient value of many common foods on the basis of how many nutrients they deliver to your body for each calorie consumed. Unlike food labels, which list only a few nutrients. ANDI scores are based on 35 important nutritional parameters. Foods are ranked on a scale of 1-1000 with the most nutrient-dense cruciferous leafy green vegetables scoring 1000. What is the danger of folic acid in multivitamins? What supplements do you recommend? The problem with folic acid is that it is vastly different from the natural folate in plant foods. The body processes these two substances differently. Folic acid is more highly bioavailable, which leads to excessive folic acid levels in the circulation, thereby altering the normal actions of folate. Studies have shown that women who supplement with folic acid are at greater risk for breast cancer. Folic acid supplementation has also been linked with prostate cancer and colorectal cancer. Folic acid supplementation during pregnancy may also be a problem for the child. Studies link folic acid supplementation during pregnancy to increased risk of childhood asthma, infant respiratory tract infections, and cardiac birth defects. Of course, being deficient in folate is also dangerous, but deficiency is impossible with a healthy diet and high folate-containing green vegetables and beans. Supplementing with vitamins D, B12, K2; and minerals iodine and zinc is appropriate for many people on a high-nutrient diet. I recommend a good-quality multivitamin that includes these nutrients but does not contain folic acid, vitamin A, beta-carotene, vitamin E, or copper. Also, in order to achieve sufficient DHA and EPA levels—supplementation is often necessary. Low levels of DHA in the blood are associated with age-related cognitive decline and Alzheimer’s disease. What are your thoughts on cancer and cancer prevention? Health authorities claim about 50% of common cancers are said to be preventable with diet and lifestyle habits, but I think the real figure may be closer to 95%, if everyone at all ages ate a Nutritarian diet throughout life. Cancer was unheard of in human history and all healthy eating civilizations of yesteryear. If we really want to win the war against cancer, we must improve the nutritional quality of our diet. Most have heard about the antioxidant effects our bodies derive from the phytochemicals in plant foods. Our cells have built-in, powerful mechanisms to remove or destroy toxic substances, inhibit and repair DNA damage, and remove cells that are injured or abnormal before they become cancerous, but only if our nutritional requirements for essential nutrients, antioxidants and phytochemicals are met. Sometimes we see claims that a healthful diet is not very effective at preventing cancer, likely because in the general population being studied, almost no one eats a sufficient amount of plant food to produce a measurable amount of protection, or they improved their diet too late in life to offer dramatic protection. Cruciferous vegetables contain phytochemicals that have unique abilities to modify human hormones, detoxify compounds, and prevent toxic compounds from binding to human DNA, preventing toxins from causing DNA damage that could lead to cancer. Almost all unrefined plant foods studied contain cancer-fighting phytochemicals. The key is to get a variety of these foods in large quantities and minimize the unhealthy foods to create a powerful, comprehensive anti-cancer diet. Come back tomorrow for part 2 of my interview with Dr. Joel Fuhrman. For more on Dr. Fuhrman, visit: www.drfuhman.com and www.diseaseproof.com.